Made in China, Taiwan Servos Like TowerPro 5010 Servo Not Uncommon to Die. Here is How To Troubleshoot Servo Not Working With Arduino. The tools needed to check a servo is not easy to reach by a common hobbyist. Not all the hobbyists has huge knowledge around PCB inside the servo. Except genuine Arduino board, nothing purchased which are Made in China or Taiwan has warranty. Red is power – 5V. Yellow or White is PWM wire (goes to numbered I/O Pin of Arduino). 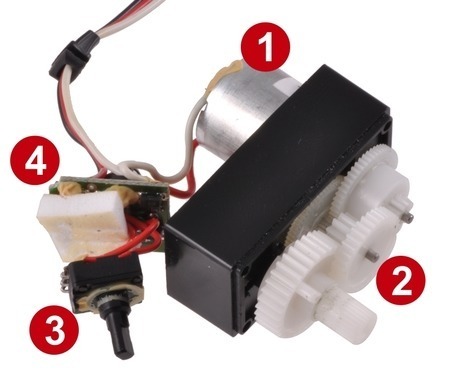 Most servos have the power on the middle pin. Check our basic tutorial on Servo which has video by searching our website for code. Servo may behave odd, including no sound, as if dead. You may find that this only happens when the Arduino is plugged into certain USB ports – change port or restart computer. Servo draws huge power. When we power Arduino via computer’s USB – current become lesser. One way of testing fix is adding a high value capacitor (like 470uF or greater) between GND and 5V of servo. Another way is powering servo’s +5V, GND from external supply and connecting that GND of external power supply to Arduino’s GND. If does not work the above methods, again make clean connection. Then add one 1K Ohm resistor in line with the signal (Yellow or White wire of servo). You can try 5K Ohm, 10K Ohm. If after search whole web, you can not find fix, simply open it up. Take photographs with Android/iPhone of each steps for the sake of joining it back. Test the motor. If the motor does not work, you can replace it. It happened to us that after writing a code spending many hours, servo’s motor died. Nothing to do. Bad servo sometimes make bizarre sounds long before death. This Article Has Been Shared 4342 Times! Cite this article as: Abhishek Ghosh, "Troubleshoot Servo Not Working With Arduino (Like TowerPro 5010 Servo)," in The Customize Windows, May 26, 2018, April 21, 2019, https://thecustomizewindows.com/2018/05/troubleshoot-servo-not-working-arduino-like-towerpro-5010-servo/.